Maggots are the immature, worm-like larvae of flies. Maggots hatch after flies lay eggs in dead or decaying materials. Maggots prefer to feed on decaying meat until they mature into adult flies. 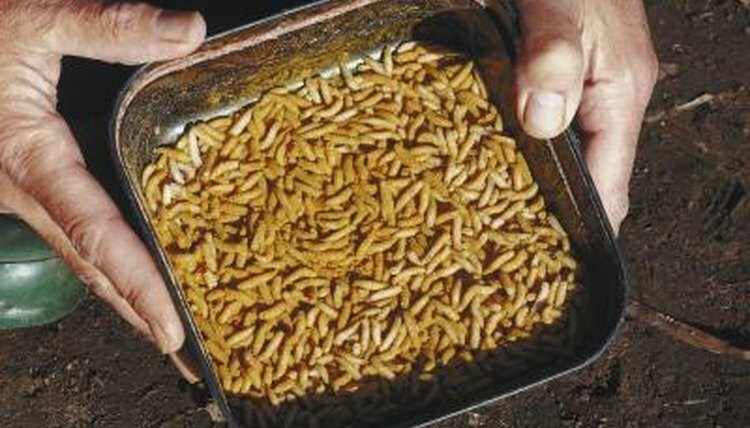 Maggots can be intentionally bred and harvested by people need them -- common uses for maggots include composting waste and fish bait. If you want to harvest your own maggots, plan ahead and create a suitable environment for them to live in. Place your rotting meat inside your large plastic dish. Place it in a location where flies will have easy access to the free meal that you're providing for them and their potential offspring. Check your plastic container every day until you notice maggots developing in the meat; this may take up to a week to occur, depending on your fly population. Place the screen over your dish to prevent any maggots that mature into flies from escaping. Harvest maggots from your plastic container by removing the screen lid and picking them out of the container while wearing gloves. Place maggots into your small container for easy storage. Replace the screen lid of your container once you have removed the number of maggots you wish to harvest.  If you want to continuously harvest maggots, you will have to leave enough maggots inside your screen-covered plastic enclosure so they can mature into flies, which will then produce new maggots. You will also periodically have to add new decomposing meat to the container so they do not run out of food.